Sugar is the most heavily subsidized (federal welfare) crop in the United States. Major players include the Fanjuls of Coral Gables and Palm Beach and U.S. Sugar Corporation. Every year they take a portion of taxpayer largesse and sprinkle it through Congress and the Florida legislature (and executive branch). Big Sugar's political operations, fortified by the Citizens United decision by the US Supreme Court, are like the tentacles of an octopus, reaching from paid resort trips to the Dominican Republic, to hunting trips to the King Ranch in Texas, and all the way down to local county elections as was the case, this year, in Martin County. Bullsugar emerged in the Palm Beach/ Martin County to combat massive fresh water pollution allowed by the State of Florida, after historic rainfall afflicted the region's rivers, bays and estuaries with a toxic stew and algae as thick as guacamole. Natural resources -- including fish and wildlife -- were devastated. The harm extended to people. Toxic algae can have serious effects on health. People have also contracted rare and even deadly bacterial infections from Florida's polluted waters. Wildlife gone. People sick. Real estate values uncertain and businesses in desperate trouble. Bullsugar is fighting back against a rigged system in favor of the polluters. The organization and its spokespersons have been targets of ad hominem attacks by Big Sugar mouthpieces. 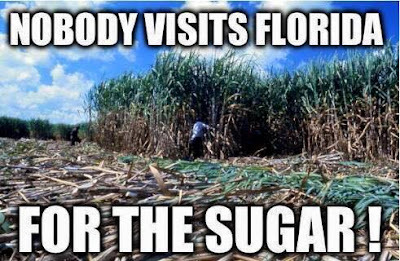 Moreover, Big Sugar has unrolled a comprehensive marketing strategy to interfere with efforts to keep taxpayers safe; obstructing Senate President Joe Negron's plan to put 60,000 acres of land now in sugarcane production into service to store and cleanse Lake Okeechobee's filthy runoff. It is a desperately sad story of 2016, with a silver lining: with your help Bullsugar can help grow a populist movement to support Senate President Joe Negron's plan to purchase 60,000 acres of sugar lands. The money is there. The science is rock solid. All that is needed: political will. Here is an end of year message from one of the most knowledgeable voices for Florida Bay and the Everglades, long-time Florida Keys fisherman and entrepreneur, Sandy Moret. On behalf of the founders of the Now or Neverglades Declaration, I want you wish each of you Happy Holidays and a Healthy New Year! As 2016 comes to a close in our lives as Everglades and clean water warriors, we must ask ourselves - what is ahead? This year began with toxic, algal blooms in South Florida waters (including our coastal communities and Florida Bay) - yet ends with hope for what is to come next. We have found an Everglades champion in Joe Negron. In August, in front of a standing room of business leaders, environmentalists and local residents, Florida Senate President Joe Negron announced his plan to move forward with the much-needed EAA Reservoir. The Weather Channel recently produced a piece that backs up the facts and truth behind the Lake Okeechobee problem at ToxicLake.com, and what's at stake. Also this month, The National Academies of Sciences, Engineering, and Medicine's Committee on Independent Scientific Review of Everglades Restoration Progress (CISRERP), a non-governmental body charged with providing Congress with independent and objective scientific information, released its sixth biennial review on the progress of Everglades restoration. The 2016 findings underscored declarations by more than 200 scientists that critical water storage outlined in the Comprehensive Everglades Restoration Plan (CERP) is falling far behind what is needed to protect this one-of-a-kind ecosystem. We are gambling with Florida's future. What the people of Florida want now is action. Senate President Negron's plan to buy land for water storage south of Lake Okeechobee is the key to getting restoration back on track. We also continue to grow our grass roots army, with close to 40,000 signatures on the #NowOrNeverglades Declaration. Thank you for being part of the movement. This is just the beginning, so we ask that you stay along with us for the ride, because the best is yet to come. We will restore America's Everglades for future generations!